“While decelerating, residential real estate prices continue their fast growing trend. (…) On average, house prices remain overvalued, raising risks of possible price corrections. Using common housing ratios and regression analysis from a cross country sample of house price reversal as in the 2015 Article IV staff report, staff estimates that in June 2016 the house price overvaluation at national level was on average around 16 percent, slightly lower than estimated in the 2015 Article IV. The reduction is attributable both to the recent slowdown in price growth and to revisions to the historical values of the housing index. 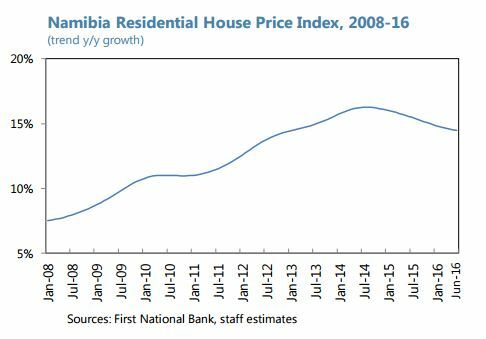 (…) Despite their large exposure to mortgage loans, banks remain resilient to large house price corrections with pressures arising only under tail risk scenarios”, says IMF’s report on Namibia.